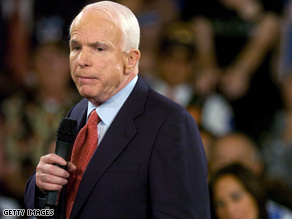 A McCain senior aide said Tuesday he “helped create” the Blackberry. Addressing the nation’s economic crisis, Holtz-Eakin told reporters traveling with the campaign “there’s no magic solution. And I don’t think that it’s at this moment imperative to write down exactly what the plan has to be.” He also said a president isn’t someone who needs to be heavily involved in policy specifics, which should be handled by “quality” advisers, and echoed McCain’s assessment that there might be a need for a “9/11-style commission” to determine what went wrong with the nation's economy, and to issue recommendations. During the 2000 presidential campaign, Al Gore drew controversy when he said that during his time in Congress, he “took the initiative in creating the Internet” – based on his work promoting funding and early research in that area. UPDATE: The Obama campaign responded to the comments minutes after they were reported. “If John McCain hadn’t said that ‘the fundamentals of our economy are strong’ on the day of one of our nation’s worst financial crises, the claim that he invented the BlackBerry would have been the most preposterous thing said all week,” said Obama campaign spokesman Bill Burton. Meanwhile, McCain senior aide Matt McDonald said that the senator "laughed" when he heard the comment. "He would not claim to be the inventor of anything, much less the BlackBerry. This was obviously a boneheaded joke by a staffer," McDonald said. Lmao. Wow. They're really grasping at straws here. This is SILLY SEASON !!!! Hate to break it to you McCain, but Blackberry is from Canada. Nice try though. He can't use a computer, doesn't know how to email, yet is responsible for the creation of the blackberry? I learned to run before I learned to crawl and walk , so I believe him. I've got a name you're probably familiar with hearing a lot... Haywood Jablome? Sarah.....and my last name isn't Palin! People you missed the bigger issue. McCain's advisior said he doesn't EXPECT McCain to know every detail about the economy, finance, etc. He will depend on Advisors for this! So instead of him acting like a President he will DEPEND on Advisors to make the decisions for him! WOW! Isn't Bush doing the SAME THING and that's why we're in the mess we're in now! Calm down you desperate Left Wing Radicals!! McCain NEVER made such a statment and even LAUGHED when he heard it. He said "it's crazy to think I invented anything, never mind the Blackberry". WOW, are the Liberals desperate..
Just go back to Bashing Palin why don't you! GEEZZZ!